These stunning wooden window shutters let in maximum light, creating an airy, clean and modern finish for this Dining room in Highgate. Wooden window shutters are a great solution for modern homes which wish to maintain an uncluttered unfussy look to their home. Shutterly Fabulous shutters have a whole variety of styles to choose from, creating so many and sometimes dramatically different looks. Take a moment to browse through the shutter gallery to see what options you have open to you and see if there is a style which you think will work well for you in your home. Our Highgate customers here have opted for full height panels, two panels on each window, with a mid rail at the mid point of the window breaking up each window into four perfect squares. They have opted for our ‘open sky’ design of push rods on the wood shutters. This means that the panels are not broken up further by a vertical line of a push rod running through the centre of the panel. 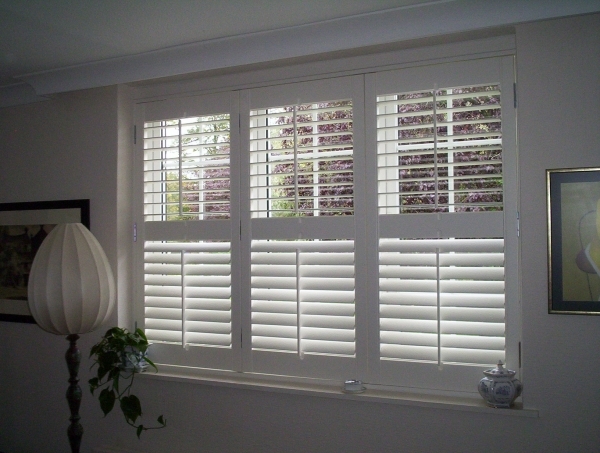 This ensures that the panels of the shutters chosen by our Highgate customers remain clean and modern looking. The shutters are mounted inside the recess, which means they will fold onto each other when the interior shutters are opened, therefore will not take up too much space in the room when the panels are folded back. Read about Shutterly Shutters in the press.